For seasoned bettors, filling in a betting slip will come as second nature. On the other hand, if it’s your first time placing a bet, you might be looking at this piece of paper thinking “how do I fill the damn thing in? !” Fear not, we’re here to explain the basics so you can get your bet on in no time at all. In Canada, sports betting is run by provincial lottery corporations. Games are available at lottery retailers such as retail stores, bars and pubs or casinos. Let’s take a look at the different names given to sports betting games in Canada. These vary according to the province you are in. For example, if you are in Ontario, you will need to find your nearest OLG retailer in order to place your bet. How to fill in the betting slip? To fill in your betting slip, you will need to use the match list, which is a list of games and betting selections. Each selection is accompanied by its odds, which are used to calculate how much of a payout you get if your bet wins. In most cases, you will have to make a parlay bet with at least two or three selections, as single-event sports betting is not currently permitted by Canadian law. The betting slip itself resembles a lottery ticket and you will need to mark the correct boxes for your selections using a pen. Once you have made your selections, check the relevant box for the wager amount. You will typically be able to choose from small sums, like $2 or $3, or round numbers like $10, $15 or $25. The maximum wager allowed is usually $100. Then take your betting slip to the retailer to place your bet. You will be handed a receipt, clearly showing the selections, odds and the amount of your wager. Before leaving, be sure to check that your receipt matches what you expected, to avoid any confusion or disappointment later. Tip: Most websites, like PRO.LINE and Mise-O-Jeu, will allow you to view match lists online and simulate your selections to see the odds and winnings. For convenience, you can print out your simulation to take with you to the retailer. There are several different kinds of betting selection that you can wager on using a betting slip. 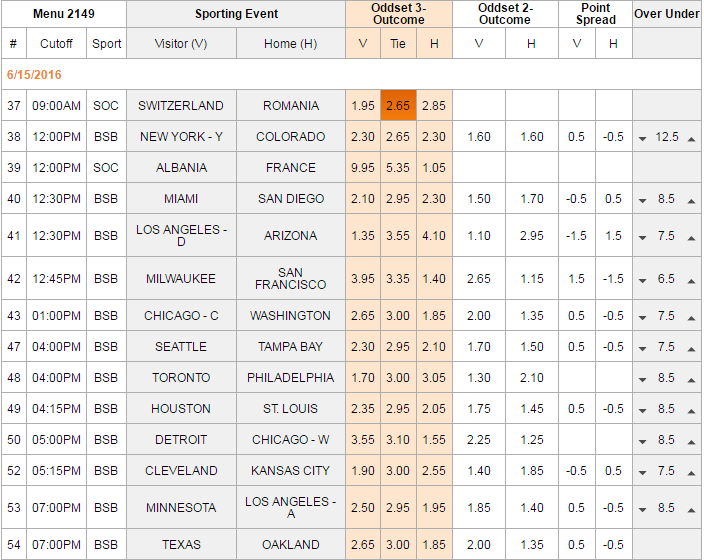 Some of the most commonly available are the MoneyLine, the Spread and Over/Under. MoneyLine – The easiest bet game bet to understand: which side takes the victory? Sometimes, it will be a choice of two outcomes: the visitors or the home side. In certain sports, you can also wager on a tie. Spread – The perceived weaker side is given a points headstart. In the example below from a basketball match, Cleveland is seen by the bookmaker as more likely to win than Golden State. However, if the game finished with a score of 100-99 in favor of Cleveland, game bets with the 2.5 point headstart for Golden State would win. Over/Under – Whether the total points scored in a game will be higher or lower than a certain amount. This is usually not a full number, to ensure that bets either win or lose i.e. they do not tie. In a soccer match, the over/under amount is often 2.5 goals, whereas in baseball it could be 7.5 or 8.5 runs, for example. Do you want to know why odds change? Check it out here! We hope our guide helps you to have a hassle-free betting experience and of course we wish you good luck with your wagers.